I love the Penguin clear stamps by Imaginisce, they are adorable. They have the Penguin Chick and Penguin Dude. I still have to make a card with the Penguin Dude. They are so adorable though. I bought the pattern paper when I purchased the stamps through All That Scraps (I've ordered from them several times they are awesome). The card layout came from SCS SC179 as soon as I saw this challenge I knew what I was going to do. Adhesive ribbon! How cool is that! penguine! AWWW! so CUTE! thanks for the comment, lol. i LOVE your banner! so adorable!!!! aww! the flower rocks.! 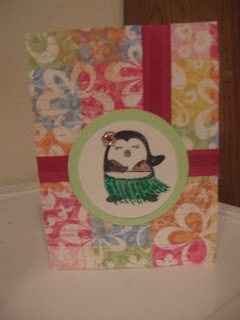 Oh that penguin is so sweet and the Tahita paper is fab---u---lous!!! And I sure love that gorgeous pink flower on your header!! kool banner=] that is soooooooooooooooooooooooooo cute!! Too cute. I've looked at those stamps a couple of times.